A new generatin of Raw Motors. Answer: This kit will add about 20lbs to your bike. Question: How do I start and stop my bike with the 80cc Raw Motor Bicycle Engine? 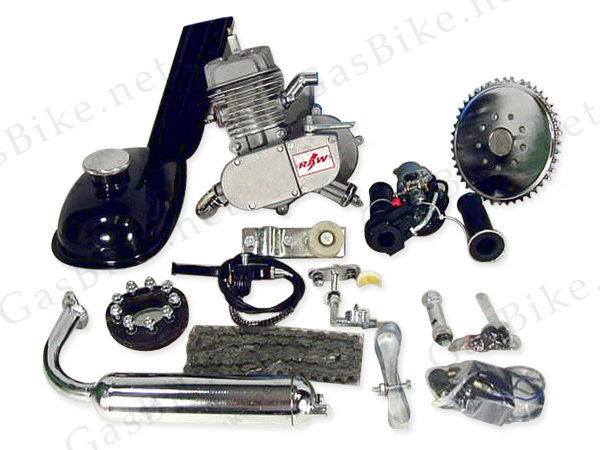 80cc engine kit is about 12" in height, 10" in length and 5" in width. Kit fits on standard 25mm 29mm frame tube. Larger frame size requires drilling into bike frame and use of the universal face plate. Large bikes (with larger frames/down tubes) may require the Universal Motor Mount. *Orders received Monday - Friday by 3:30PM PST are eligible for Same Day Shipping! For International and Canadian shipping we suggest USPS.